We’re excited to announce a new release of Packrat, a tool for making R projects more isolated and reproducible by managing their package dependencies. Automatic snapshots ensure that new packages installed in your project library are automatically tracked by Packrat. Bundle and share your projects with packrat::bundle() and packrat::unbundle() – whether you want to freeze an analysis, or exchange it for collaboration with colleagues. Packrat mode can now be turned on and off at will, allowing you to navigate between different Packrat projects in a single R session. Use packrat::on() to activate Packrat in the current directory, and packrat::off() to turn it off. Local repositories (ie, directories containing R package sources) can now be specified for projects, allowing local source packages to be used in a Packrat project alongside CRAN, BioConductor and GitHub packages (see this and more with ?“packrat-options”). In addition, Packrat is now tightly integrated with the RStudio IDE, making it easier to manage project dependencies than ever. Download today’s RStudio IDE 0.98.978 release and try it out! 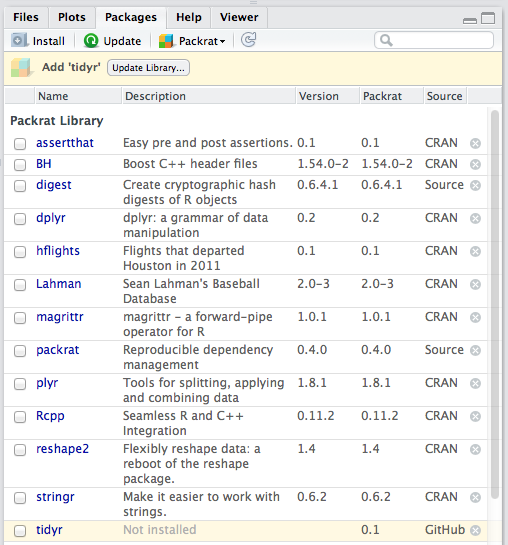 Packrat will be coming to CRAN soon as well. If you try it, we’d love to get your feedback. Leave a comment here or post in the packrat-discuss Google group.